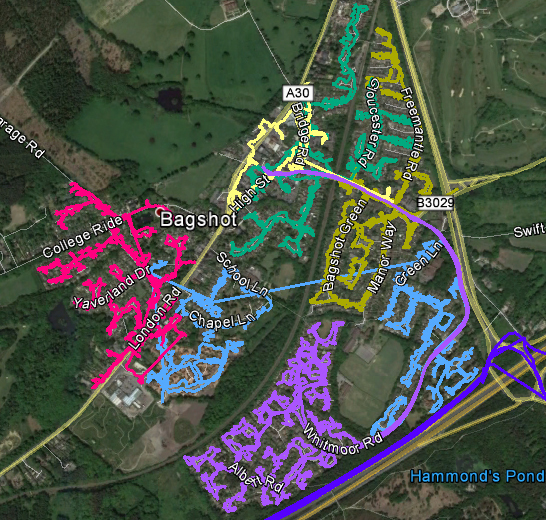 For the most reliable GPS tracked leaflet distribution Bagshot GU19, Shareplan Leaflet Distribution can offer you a complete service. Bagshot is a town located in the north-west of Surrey, in the Green Belt which surrounds London. A great deal of the land around Bagshot is owned by the Ministry of Defence and is also part of Windsor Great Park. Prince Edward, the Earl of Wessex, has made his home in Bagshot Park and the Pennyhill Park Hotel, where the England rugby team train, is also situated in Bagshot. Through our geoplan map we know the total number of residential delivery count is 2661. About 68% of these properties comprise of detached and semi-detached houses. This data can help you position your product and services to the targeted demographic audience, which could be people who own gardens for instance. There is also usually more work to be done the bigger the properties are as there is more to maintain. Our Bagshot leaflet delivery service is second to none. All our door-to-door deliveries are tracked by GPS. We will send you a report when the flyer delivery has been completed. From there, it only takes a couple of moments to download the data and then you can view the exact route the leaflet delivery person took to deliver your leaflets. 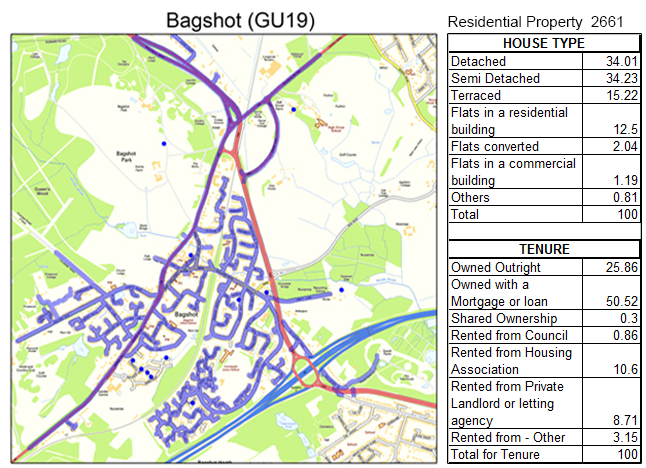 As well as providing economical and reliable flyer delivery in Bagshot, we also offer a targeting and mapping service to make sure you are delivering to the right target audience. You can give us a royal mail postcode sector in Surrey, for example, and we will supply you with a report and map showing the number of residential deliverable properties. Your leaflet design plays a big part in ensuring your flyer distribution campaign is as productive and effective as possible. Our free one-to-one consultation gives you the ideal opportunity to have a chat with one of our in-house marketing experts. Remember: we want your campaign to be as successful as possible because the more successful you are, the more successful we are! If you are struggling to decide where you want to start with your leaflet delivery campaign, you can even use our graphic design service. Our in-house design team will be happy to help you get the most from your direct response marketing. Of course, our first-rate flyer delivery service wouldn’t be complete without giving you the chance to get an unbelievable deal on your leaflet printing! Get a saving on your door-to-door delivery when you order your leaflet printing and leaflet delivery together from us! With our Surrey leaflet delivery service attracting a repeat business rate of over 78%, you can’t go wrong with Shareplan Leaflet Distribution’s complete service. Click the link to get your free quote now! Our door-to-door distribution is available in all the main towns in Surrey including: Farnham, Camberley, Frimley, Lightwater, Windlesham, Bisley, West End and Chobham. Please feel free to take a look at our other coverage areas and also visit our FAQ if you have any other unanswered questions. We also take pride in being a member of the Leaflet Distribution Organisation (LDO) so you can be confident in our ethical service.